Atonal FX patches have their place due to their flexibility, but sometimes you need something that fits with your project musically as well as sonically. 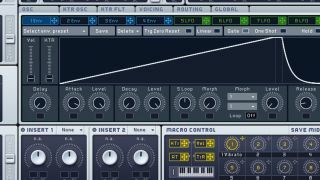 The technique for programming pitched FX is basically the same as that for any other kind of synth FX patch. Most of the time it's simply a case of choosing a suitable oscillator, as opposed to a noise generator or resonant filter, as the main sound source. Once the right oscillator is selected and tuned with other project elements, the fun can begin. LFOs, envelopes and effects can all be added in the same way, and in this example, the oscillator's pitch is modulated. With some further processing and filtering applied, you'll have a riser effect ideal for adding suspense and tension to your music. For more on programming synth FX, pick up Future Music 290, which is on sale now. Step 1: To speed things up, some of the modulation has already been routed here. The pitch of the first oscillator is modulated by an envelope with a very slow attack. The result is a saw wave that rises in pitch around two octaves in a short time. Step 2: Next, the cutoff frequency is modulated with the same envelope, creating filter sweep in time with the rise in pitch. This modulation makes the effect of the rise a bit more intense. You could also modulate other destinations such as volume or pan. Step 3: Finally, make the patch more interesting by adding processing and effects. We've added unison to make it wider, some high-end EQ for bite and presence, and some delay to open the whole thing up.